This week’s contributing writer, Betsy Andersen, is founding Executive Director of Museo Eduardo Carrillo. She received her BA in studio art and studied under Eduardo Carrillo in the 70s. 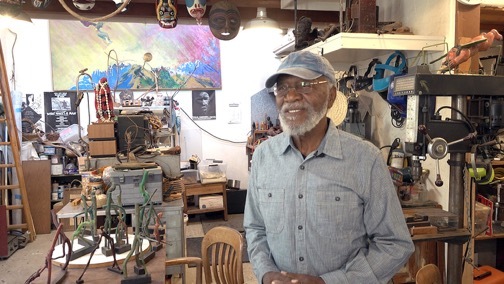 “Seen/UnSeen- Stories into Creativity” is a documentary by Director Wallace Boss focused on the artistic process of three California Central Coast artists: Doyle Foreman (sculptor), Edward Ramirez (photographer), and Claire Thorson (painter). Filmed in their studios, the artists candidly discuss how their art comes into being. They are unified by their connections to University of California, Santa Cruz and a commitment to their art practices, but therein the similarities end. Foreman, Professor Emeritus in Art, draws on nature, gleaning actual objects or references from the land that find their way into his bronze castings. Thorson, UC graduate and Professor of Art at Cabrillo and Monterey Peninsula Colleges, finds source material for her roughly hewn paintings and drawings through contemporary photo journalism. Ramirez, UC graduate and North Coast Teen Center Coordinator at the Davenport Resource Service Center, meets people on work sites and in the neighborhood in which he grew up, developing rapport with his subjects before photographing them. To watch “Seen/UnSeen- Stories into Creativity,” go to https://museoeduardocarrillo.org/seen-unseen/. As an online museum, one of only a handful internationally, Museo Eduardo Carrillo is committed to filling the vacant spaces in Art History through its varied programs. We found that through our unique curatorial offerings— and our always free and open policy— we could have an impact. There are so many voices we have yet to hear, images yet to be seen. We provide a place to show work of should-be-seen artists. Because Museo is committed to providing materials to educators, we think that the conversation about the “how” is important: how have these artists made a life in art? What sustains them? Being online means that Museo develops ways to reach out to our community and beyond. We aim to fill the vacant spaces in art history through our Hablamos Juntos project, the Central California Coast Chicano/a Legacy project, and our film series “Seen/UnSeen”. The Hablamos Juntos materials feature free, downloadable broadsides of contemporary Latinx Art and artists in their own words discussing their backgrounds, the inspiration for and approach to their artwork, and their mentors. Our Hablamos​ ​Juntos Creating​ ​Bridges: ​ ​Personal​ ​Journeys into​ ​Art​ ​and​ ​Writing curriculum assists teachers to bring Latinx art into the classroom for thoughtful writing but can be meaningfully adapted for a variety of purposes by formal and informal educators. Museo is particularly interested in teens as they are the next generation of art appreciators. We want them to understand that art is not separate from their lives but can fuel moments of reverie. Because of this goal we developed and continue our partnership with the Young Writers Program. Through the program with YWP, students improve their ability to share their feelings and identities through writing inspired by Latinx art curated through Museo’s Hablamos Juntos programming. These teens, who often undervalue their own abilities, can produce deeply personal writing that resonates with all of us, with help from trained YWP mentor. Museo also understands the need for documenting artistic legacies and the importance of community partnerships. That is why we have initiated the Central California Coast Chicano/a Legacy project, which focuses on exploring the untold story of this region’s significant place in the Chicano movement. It is this commitment to assuring that artists stories and legacies are remembered made us jump at the chance to contribute to the county wide exhibition collaboration titled “Spoken / Unspoken” by starting “Seen/Unseen,” a film series about creativity. Launched by the Cabrillo College Gallery and funded by the 2016 Rydell Grant from the Community Foundation of Santa Cruz County, the initiative brings together eleven art venues across Santa Cruz County under a unifying theme. A guiding principle of the project is to give insight: “Art can inform us, speak unspoken secrets and give a voice to the silenced. It can express deeply personal thoughts and desires.”¹ Each venue has selected the topics they want to focus on. The term “resistance” can represent various profiles from opposition to struggle; it can also portray resilience, strength, courage, and standing up for basic rights, outspoken topics of social justice from land rights to human rights, and in a variety of unspoken print media and conceptual practices. Many of the works in the exhibition are from Self Help Graphics, a print studio and gallery founded in 1970 in the heart of East Los Angeles, dedicated to the production, interpretation, and distribution of prints and other art media by Chicano/a and Latino/a artists. The exhibition includes artifacts about Angela Davis and posters from the Guerrilla Girls. 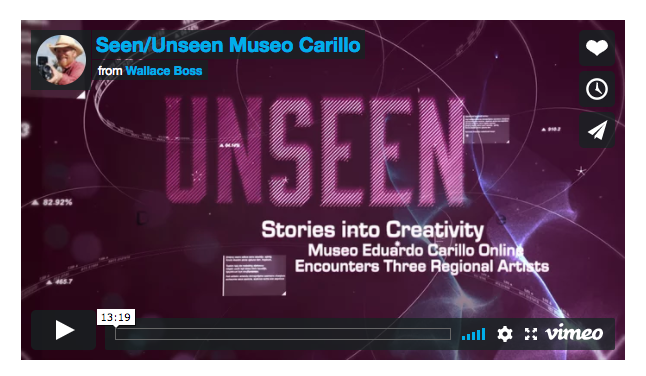 “Seen/UnSeen- Stories into Creativity”, produced by Museo Eduardo Carrillo, is a documentary film about the creative processes of three Santa Cruz artists. One might also suggest that the film itself is a creative project and so in fact the film presents four artists, including the filmmaker. Since the “Seen/UnSeen” artists are affiliated with the University, it is fitting that the Sesnon hosted a screening of “Seen/UnSeen” and panel discussion with the artists as part of their “Spoken/Unspoken” county-wide exhibition initiative. For more about this project, please listen to this interview on “Artists on Art” with film maker Wallace Boss and artist Claire Thorson conducted by Nada Miljkovic on radio station KZSC 88.1FM at University of California, Santa Cruz.